If there's one thing last month's Rio Olympics drove home, it's that athletes can spend years training for their brief moment in the spotlight. (That, and the fact that Usain Bolt might actually be a superhero). The upcoming Culinary Olympics, taking place next month in Germany, are no different. For Chef Corey Siegel, one of eight chefs competing together as Culinary Team USA, the dream of competing has been a decade in the making. "It started for me when I was 15, when I first found out I wanted to start cooking," he says. "I was in a vocational program and I had a teacher that told me, 'I think it'd be really awesome if you were the youngest to ever make Team USA. I was like, 'Yeah, sure Chef, whatever it takes!'" 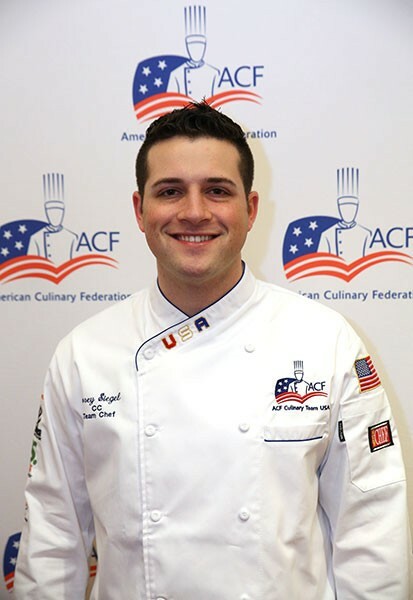 Following the advice of his instructor, Siegel would go on to attend the Culinary Institute and intern under chefs who had previously competed with Team USA. The icing on the cake was securing an apprenticeship at the Greenbriar Resort. "If you can make it there," he says of the resort's competitive three-year program, "You can make it on the team." Siegel's hard work got him noticed, and he was one of 30 chefs invited to Charlotte's Johnson & Wales University to compete for a spot on Team USA. "My goal was to be the youngest on the team," he says, "And I ended up getting the letter that said I made the team the day before my 23rd birthday." Now based out of the Queen City, the culinary Olympian splits his time between training for the upcoming quadrennial competition, and working as head chef at Electrolux. Creative Loafing: The Team USA chefs are based around the country — how do you communicate and work successfully as a team? Corey Siegel: We talk once or twice a week. We're constantly sending pictures to each other. 'Hey, what do you think of this, what do you think of that?' We have a pastry chef, we have guys that are really good at butchering, guys that are great at making sauces, guys that are delicate so they work on a fish course. So we look at everyone's strengths and weaknesses and try to make the strongest team possible. My role in cold kitchen in Germany, I'll do a three-course vegetarian menu. In the hot kitchen, I'll assist with the pastry chef, so me and her will take care of dessert. Do you feel any pressure living up to the legacy of teams that have competed in prior years? Usually the U.S. places very well. We haven't won since 1988, but we always do well. Usually we'll win one of the two categories, either hot food or cold food. When we competed in the Culinary World Cup in Luxembourg, we had the highest score in the cold kitchen — the highest score in the world! When we put up our food, we thought we had embarrassed our country. Our standard was so high we thought we weren't good enough. We were aiming for the stars, we're perfectionists, we dedicate our lives to this stuff. One little thing out of place drives you crazy. Then the score came out, and we were best in the world! What are your plans after the competition — training for the Culinary Olympics 2020? Absolutely not! (laughs) It's a ton of work. Not that it's a bad thing, but after this, I want to go in different directions. I'm going to take a break for a bit. It's been six years of nonstop competing. You don't get to see friends and family as much as you'd like to. So take a little time to catch up, then maybe open my own place eventually.